Forgetfulness is worrying for students and their parents especially during exam season and causes exam stress. Although it is very common, the stigma associated with ‘forgetting’ makes parents and students to panic. However, most parents don’t know that forgetting is a natural process, not just among kids but among adults too. Research shows that students forget nearly 40% of well-understood concepts within a week. The only way to tackle this is to revisit those concepts at appropriate intervals. Studies have also shown that repeating information within the first 24 hours of learning reduces the rate of memory loss tremendously. But, how many kids out there have been following this process of repeating information. As a parent be convinced that forgetting is a natural process and could be tackled only by revisiting the information. Forgetting does not decide a student’s ability, but only highlights the need to change on how your child has been revising his or her lessons. Make the child feel confident: Instilling confidence among kids before any exam is crucial for their overall well-being during the exam. Tell them it is fine if they find certain questions harder. Just make sure, they attend all the other questions they are sure of. Without that, the kids become anxious in case they face questions they haven't prepared for or forgotten, which in turn will have more repercussions on the entire exam performance. Handling this element of anxiety will help kids to perform better. Use the spacing effect technique for revisions: Incorporating a brief revision session for a chapter, say 20 days after the unit test, helps in re-exposing kids to previous concepts. It could be from a brief run through of revision notes that your child has prepared or from educational apps that offer ready revision notes for students. Become the student yourself: Yes, you heard it right. Remember the time when your child wanted to be the teacher on their first grade? Give them a chance now! Ask them to explain concepts such as refraction or polymorphism at regular intervals and get your doubts clarified acting as a students. When kids explain to you, fading memories are reactivated and strengthened. Practice with Quizzes and Tests: Sometimes taking routine practices could be extremely boring. Taking chapter- wise quizzes can become a good alternative for practice, which makes revision fun and engaging. Apps like QuizNext (for CBSE & ICSE students) and IXL (Foundation till Year 12 students) help students to practice their learning through quizzes and skill based questions. The former also tracks the forgetting curve of kids across chapters and then recommends what chapters they should be revising on a given day. Use Tree diagrams or Sentence Diagram: This method works effectively for English Grammar. It consists of a simple sentence with a head noun as its subject divided from the predicate (verb and its object) by a vertical line running through the horizontal line called the base line. Modifiers of the subject, predicate, or object are placed below the base line.The qualifiers are placed on diagonal 1ines attached to the modifiers as seen in example (1). In the second example (2),the indirect object is placed below the verb.This can extend further as the sentence becomes more complex. This method is called as "Reed–Kellogg diagram" named after Alonzo Reed and Brainerd Kellogg. 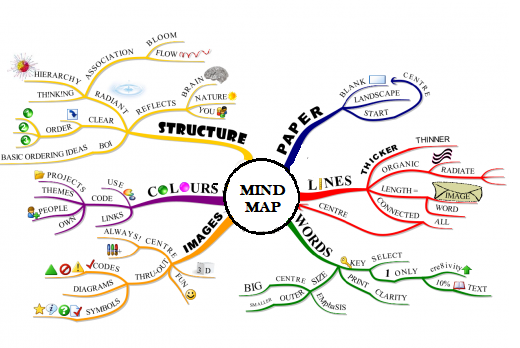 Create or Use Mind Maps: It is an effective technique of note-taking. All you need is to create models around real-life objects so that you can visualise the entire picture than remembering words. It is important to put a lot of emphasis on using lots of images, colours and as a final tool, use text to create the mind map. Many books have started to use this approach and you also can find different mind maps for various subjects on the Internet. Example: Mind map for Photosynthesis.You can also try the books of Mind Maps by Tony Buzan for learning this technique. Go beyond the syllabus: The education system has a notion of ignoring everything that is not in the syllabus. This thinking not only kills the curiosity of the child, but also limits the context in which your child has learnt a chapter. A good way to tackle this problem is to make use external help such as Google or YouTube to explore interesting websites and concepts with kids, at least one topic in a week. Learning chapters outside the context of just textbooks encodes learning more deeply and will increase information retention. Visualise your own way: Encourage kids to draw out stories or any topic and let them draw the way they understand. For instance, to explain a chemical reaction, kids may end up writing molecules as circles, and while doing they will visualise how big that molecule is compared to another molecule. If they don’t not know that, then it is the time to go and refer back to books. Look at forgetting patterns: Many students tend to forget Chemistry or History because text books do very little to make it interesting. Look for the topic that your child finds it hard to remember and supplement them with materials like graphics, research books, videos and documentaries from library or Internet. This improves the visualisation capacity so that they can build mental model about the topics. Practice! Practice: Finally, practice the above techniques every now and then. Pick any two strategies to begin with, and do them frequently. Recollect information that the kids learn now and then making sure they are on the right track towards the exam. Remember that forgetting is a natural process. But, to easily tackle the forgetting curve, it requires some time and discipline to see the results. I would be happy to know which technique you would like to use to help your kids. Also, if you are using any other method, please tell us too! Kindly leave your comments below.